As one of only 12 small boat harbors left along the California coast, the Channel Islands Harbor is a rare and precious coastal resource within the City of Oxnard. 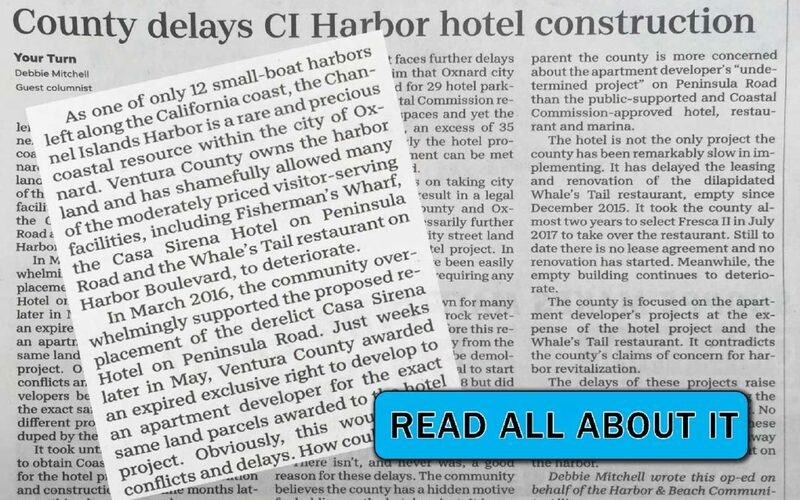 Ventura County owns the Harbor land and has shamefully allowed many of the moderately priced visitor serving facilities including Fisherman’s Wharf, the Casa Sirena Hotel on Peninsula Road and the Whale’s Tail restaurant on Harbor Boulevard to deteriorate. In March 2016, the community overwhelmingly supported the proposed replacement of the derelict Casa Sirena Hotel on Peninsula Road. Just weeks later in May, Ventura County awarded an expired exclusive right to develop to an apartment developer for the exact same land parcels awarded to the Hotel project. Obviously, this would cause conflicts and delays. How could 2 different developers be given exclusive rights for the exact same 2 land parcels for 2 different projects? The community felt duped by the County’s action. It took over 2 years until July 2018 for the County to obtain Coastal Commission approval for the Hotel project to start demolition and construction. Still 9 months later, nothing has happened – no demolition, nothing. The Hotel project faces further delays by the County’s claim that Oxnard City street land is needed for 29 Hotel parking spaces. The Coastal Commission required 344 parking spaces and yet the County provided 379, an excess of 35 parking spaces. Clearly the Hotel project’s parking requirement can be met without City street land. between the County and Oxnard. This would unnecessarily further delay the Hotel project. City street land is not needed for the Hotel project. In fact the project could have been easily planned and built without requiring any City street land. The County has also known for many years that the Peninsula’s rock revetment needed repair. Now before this repair can be done economically from the landside, the old Hotel must first be demolished. The County had approval to start Hotel demolition since July 2018 but did nothing. street land for 29 Hotel parking spaces? the County has a hidden motive for holding up the Hotel project. It is apparent the County is more concerned about the apartment developer’s “undetermined project” on Peninsula Road than the public supported and Coastal Commission approved Hotel, restaurant and marina. The County is focused on the apartment developer’s projects at the expense of the Hotel project and the Whale’s Tail restaurant. It contradicts the County’s claims of concern for Harbor revitalization. The delays of these projects raise suspicions and questions regarding the competence of Harbor management. No responsible landlord would allow these highly desirable locations to waste away for so many years and create a blight on the Harbor. 100% of your donation is used for Legal Fees and Experts. Is Now the Time for Channel Islands Harbor to Update its Public Works Plan?